Protractor goniometer. Features a head with 360 degrees of coverage in 1 degree increments to ensure ISOM accuracy. 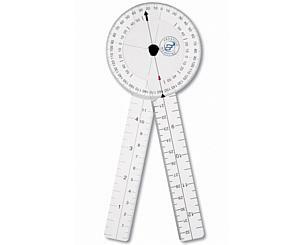 Measurements in inches and centimeters are also available o the arm of the goniometer. Constructed of Lexan for durability. 8 inch version.